Modern design meets timeless character in The Bradley Classic. 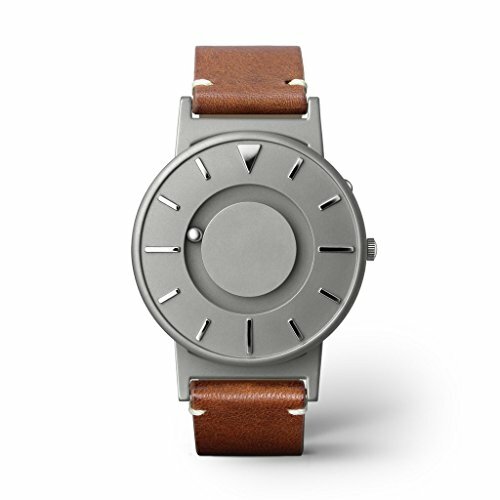 We pair the iconic, minimalist face of The Bradley with a tried-and-true leather band. Warm, chestnut leather with ivory accented stitching compliments the cool, silver titanium case body in this well-rounded piece of craftsmanship. The Bradley timepiece features raised hour markers that allow you to feel the time by touch: a triangular marker for twelve, elongated line segments for three, six, and nine, and shorter line segments for the other markers. Bradley will easily withstand splashes or brief immersion in water, like getting caught in the rain or washing hands. However, it is not sufficiently resistant to water sports, swimming or bathing. Bradley is NOT intended to be worn during high-level activity sports.